FlowGun™ Completion Technology from Nine features a pressure-activated toe sleeve that eliminates the need for wireline or coiled tubing. after installing hundreds of FlowGun Systems across North America. 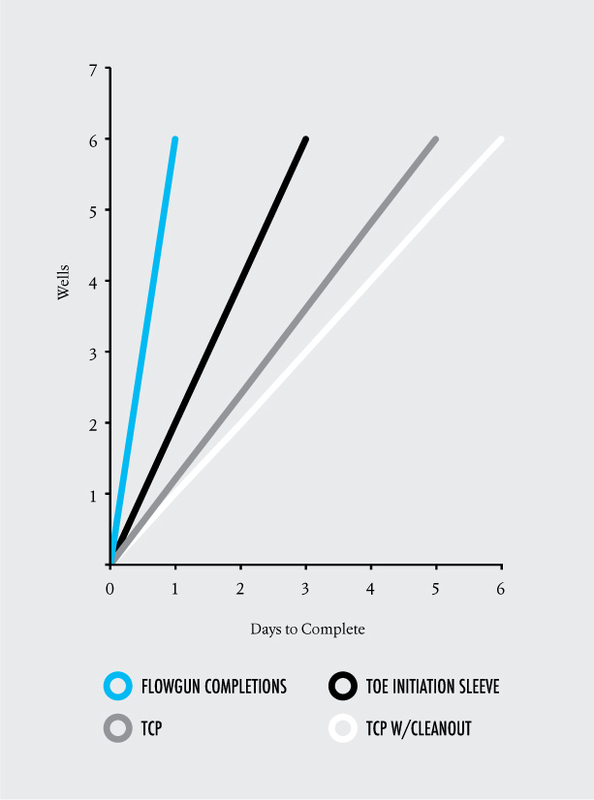 A true innovation, the FlowGun well completion system from Nine offers a safe and cost-effective advantage to your stage-1 completions. Completely interventionless, this casing-conveyed perforating technology offers infinite efficiency, control, and flexibility. Consolidating numerous downhole jobs into one tool and one crew dramatically cuts cap-ex and labor costs. No sleeves to shift. No wet shoe required. No electronic detonation, wireline, or coiled tubing needed. You eliminate an entire phase of completion, which means you’re not paying for additional water, tank trucking, BOP rental, coil tubing, chemicals, and labor. The operation is simple. The casing assembly is conveyed into the wellbore, taking FlowGun clusters to targeted depths. Once the wellbore is cemented, the casing is pressure-tested and the perf charges are fired, delivering one of the highest injection rates currently available on the market. It takes 30 minutes—from pressure testing to unfettered reservoir access. Extend the productive life of your conventional and unconventional wells with MorphPacker Completion Technology from Nine. What is FlowGun’s success rate? We have installed hundreds of FlowGun systems and have achieved greater than a 95 percent rate of successful detonation—100 percent with our newest model. In fact, of all the jobs set up for a first full stage, all but one were successfully fracked—and that one was still unsuccessful even after numerous re-perf attempts. How does the FlowGun system detonate? Instead of electric charges, the FlowGun System uses pressure-actuated detonation. This means there is no risk of surface or premature detonation. FlowGun clusters cannot detonate electronically, eliminating the possibility of premature firing due to stray voltage. Considerable, given that you have eliminated an entire phase of the completion process. From the time you begin the pressure test of the wellbore, through detonation, to reservoir access takes less than one hour. In one day, our customers have finished as many as six completions, which is roughly six times faster than a standard TCP with cleanout. Although every completion project is unique, time is money, so really it’s just a matter of doing the math. Again, you eliminate an entire phase of completion, along with the associated costs of water, tank trucking, BOP rental, coil tubing, chemicals, crew, and labor. Our customers have saved up to $420,000 on a six-well pad over the traditional approach. Interventions, no. Cost savings, yes. Change your perf approach with Nine/Flowgun. Actual pressure test results that showcase the effectiveness of FlowGun.